RFK Stadium, then still called District of Columbia Stadium, opened on the 1st of October 1961. It received its present name 8 years later when it got named after the murdered senator Robert F. Kennedy. 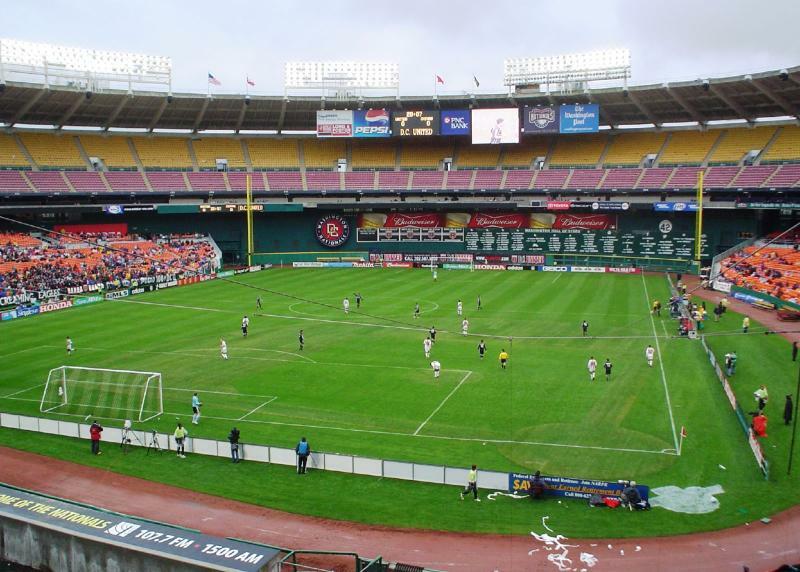 RFK Stadium was the first stadium to be designed to be able to host multiple sports, in particular American football and baseball matches, hence the odd asymmetric shape of the stands. This concept, also referred to as cookie-cutter stadiums, received following in the next decades, however never to great success as the set-up offered only imperfect solutions for every sport. This was no different for RFK Stadium and the changing of configuration between different sports furthermore proved to be very costly. From its inauguration until 1996 the stadium was the home of the Washington Redskins (American football), and over the decades several other American football, baseball, and soccer teams moved in and out. RFK Stadium was chosen as one of the playing venues of the 1994 World Cup, hosting four group matches and the round of 16 game between Spain and Switzerland (3-0). 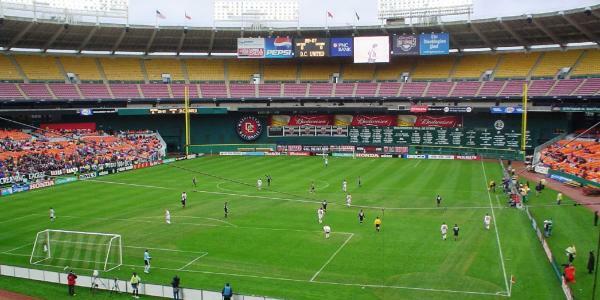 In 1996, newly formed DC United moved in and has played at the stadium since. They are currently the sole permanent occupant of RFK Stadium, but, as the stadium has aged significantly and the crowds United attract are nowhere sufficient to fill the stands, they are currently investigating building a smaller soccer-specific stadium. In 2012, DC United decided to close the upper deck of the stadium and hereby reduce capacity to 19,647 seats. RFK Stadium is located toward the east of Washington DC on the banks of the Anacostia river. The stadium lies about a mile-and-a-half from Capitol Hill and slightly under 2 miles from Union Station. RFK Stadium is situated just west of the 295 freeway, which runs along the east of the city and connects with the I-95 (Capital Beltway) in the north and south. From the 295 take the exit for East Capitol Street. If coming from the I-395 (Virginia), follow the freeway into the city and continue in the left lane (do not take the I-395 north). Proceed straight ahead until signs will guide you to the stadium. While one can walk from the eastern parts of downtown DC (as well as Union Station), there are also plenty of public transport options. Metro station Stadium Armory is located next to the stadium and is served by trains on the orange and blue line. Both lines run right through downtown DC. From Union Station it is quicker to catch a bus though. One option is to take bus D6 from Massachusetts Ave and 2nd St NE. Get the bus in the direction of Stadium – Armory. The ride takes about 15 minutes. An alternative is bus 96, which you can catch in front of the Union Station. Take the bus toward Capitol Heights Station and get off in front of the stadium. Tickets for DC United games can be bought online via Ticketmaster, or at the gates of the stadium on the day of the match (from four hours before kickoff). DC United rarely sell out. Standard tickets range in price from $26.00 to $45.00, and tickets for the mezzanine level cost $55.00. Dcunited.com – Official website of DC United. Washington.org – Washington DC tourist information. Wmata.com – Washington DC public transport information.